24 hours during which Greece has understood that it no longer has a way back. This is the briefest way to summarise the last two days, during which the drama of reaching an agreement between the parties in the Greek coalition government to implement the conditions for reforms and fiscal stability, put forward by the troika (the European Commission, the European Central Bank and the International Monetary Fund), went through several stages. In fact, this is a play which is being staged for more than 2 years, the essence of which is Greece to get the next bailout or tranche in exchange for the implementation of a package of reforms, aimed at returning the Greek economy on the path of growth and to start gradually and in a sustainable way to pay back its indeed gigantic debt, worth around 350 bn euros or approximately 160% of its GDP. With every staging of the play the drama is growing bigger, all spectators watch with their breaths held, expecting the denouement, as if not remembering what it was the last time. And every time they buy tickets with good views to the stage in order to watch it over and over again. This time however, the scenario is slightly changed. In Act One there were two plots that went on in parallel: the negotiations between the Greek broad coalition government, in which the main political parties in Greece participate, and the so called troika, representing the European Commission, ECB and the IMF; and the second line was going between the Greek authorities and the private creditors for the writing off of 100 bn euros of Greek debt. 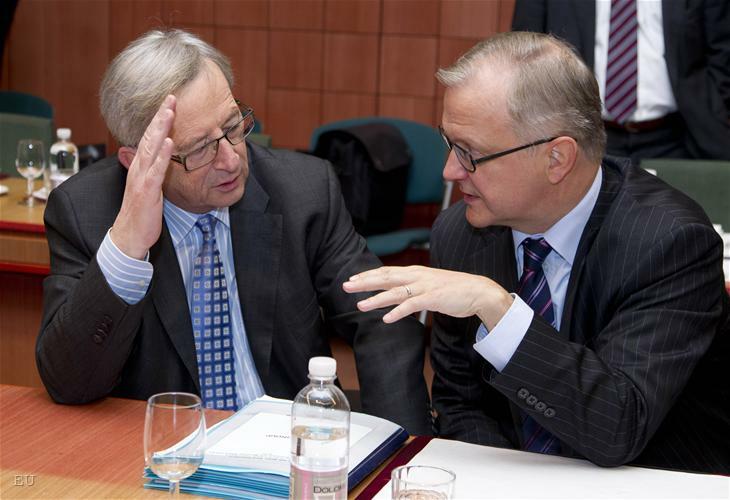 Although it was constantly pointed out that there was no link between the two, in the end of the day there is and it was officially announced by Olli Rehn, EU monetary affairs commissioner, last night. The negotiations with the troika in the past few months were taking place with a changing result - either the two sides would approach an agreement or the troika representatives would leave empty-handed for Brussels, Washington and Frankfurt. After all, on February 9th, around 6 in the morning, it became clear that something of an agreement is achieved, depending on who you speak to. 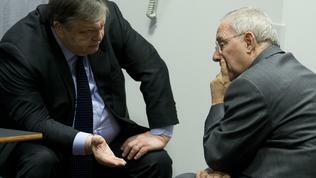 For the troika there was no agreement, for the Greek authorities there was but with one exception. This exception is worth 325 mn euros - money which need to be additionally reduced from Budget 2012, meaning this year, meaning now, meaning immediately. The Greek political players tried to explain to their European partners that there was no place left to cut from, that this was flesh that had to be cut, that this was inadmissible. Leaders of different parties showed up and spoke about the severe difficulties of the Greek people, about its innocence, about the unfairness, about how it was impossible to do that so abruptly, as if having forgotten that all these demands are not put forward for the first time. It has been spoken about the need the sum to be cut from the budgets of the supplementary pensions and if necessary - to touch primary pensions too. 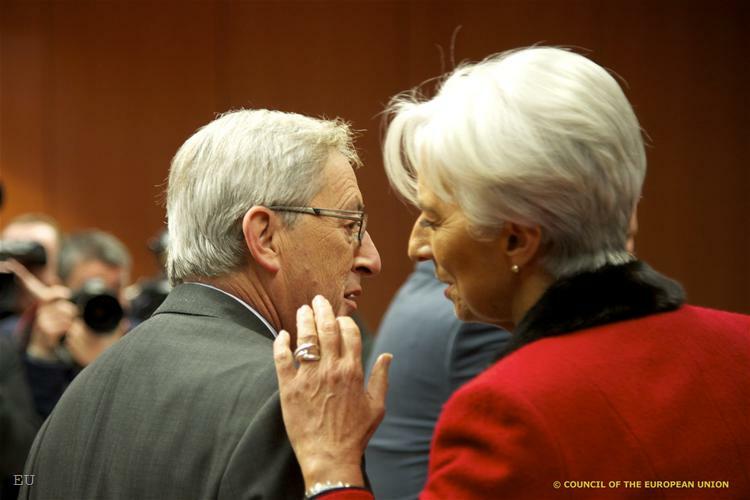 Moreover, Greek media reported that Greece was given 15 days to identify where to cut the 300 million from. 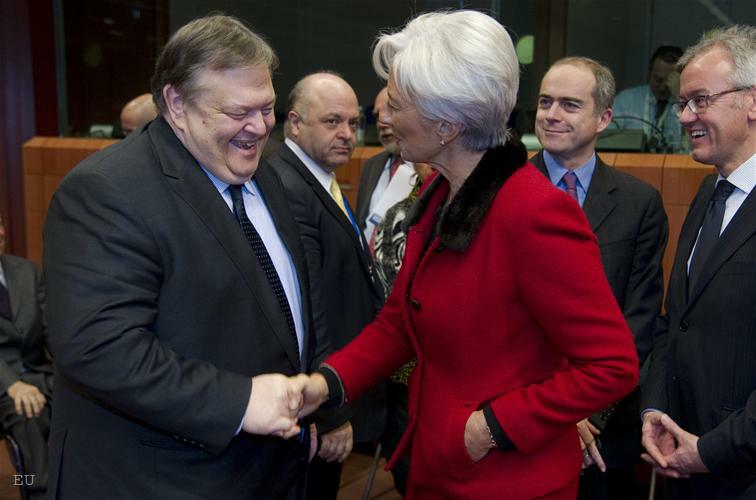 In order to enhance the feeling that the deal in general was struck, it was reported that Evangelos Venizelos, the Greek finance minister, was off to Brussels, obviously with an early plane because this information was circulating literally from 6 o'clock in the morning. Alas, the reports of participants in the troika implied that there was no agreement and that Greece had no 15 days but less than 15 hours. The suspense was additionally enhanced by the fact that in the evening, 1800 Brussels time (1900 Athens time), the meeting of the eurozone finance ministers had to start - the so called Eurogroup. 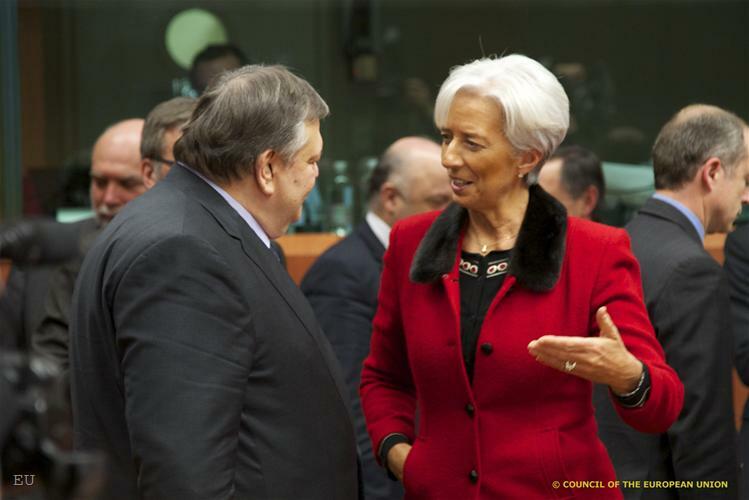 This meeting was expected back on Monday but since Thursday last week speculations started whether there would be a meeting or not, while at the end the Eurogroup sent a brief notification that there would not be a meeting on Monday, February 6th. On Monday it was also not clear when such a meeting would take place. 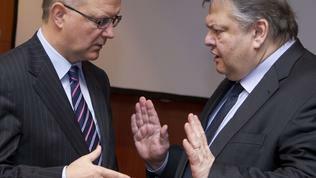 Although it was clear - whenever an agreement in Athens is reached. Are you getting confused already? Wait for the interval! A little before noon on February 9 the Greek daily Capital published the text of the agreement, which evoked further drama because it is stipulated in it that the government commits itself to a general government primary surplus of 4.5% of GDP by 2015 and that the primary deficit will be 1% of GDP. It is these numbers that stirred the moods again as they are a change to the parameters being used to calculate the size of the second bailout programme, estimated on the basis of commitments for debt reduction to 120% of GDP by 2020. The change of parameters however means that a new analysis of the debt sustainability has to be made in order to calculate how much money to be given with the second bailout programme, agreed in October last year and estimated to be worth 130 bn euros. The published draft agreement also reveals commitments of the Greek government to reduce the public sector jobs by 150,000 for the period 2011-2015 and only this year it plans to cut 15,000 public jobs. The novelty in the agreement is that it focuses on measures to stimulate the competitiveness of Greece's economy as well as to strengthen the country's institutional capacity to enable it to collect tax revenues, to fight corruption and to ensure a flow of fresh money for the small and medium sized enterprises in the country. Significant cuts are also planned in painful areas for the Greek society like social welfare and the local tax revenue offices. In the analysis of the agreement it is pointed out that the level of social spending in Greece, as a share of GDP, "remains well above the euro area average". By the end of June a review will be made of all social programmes in order to identify which should be abolished. By the way, the end of June is a threshold for many of the measures in the document, which is over 30 pages long. This is so because many of them have to deliver yet this year. During the interval before the third and final act of the Greek drama, we, the journalists were reading the draft agreement and were expecting the news conference of European Central Bank's chief Mario Draghi, who was expected to say whether the institution would participate in any way in the debt restructuring deal. If you remember, the German chancellor passed a controversial proposal last July, in which she asked the private creditors of Greece to take their share of the burden by bearing 21% losses on the Greek bonds they held. The so called voluntary hair-cut. Many of the private creditors were still wondering whether to get into the scheme or not, when in October, at one very dramatic European Council, which was even rescheduled for the same reasons, was agreed the private sector to bear 50% losses or to write off 100 bn euros. Since the beginning of the year, though, while the negotiations between the Greek government and the private creditors were taking place, a thin red line emerged, implying official sector involvement (OSI) in the deal, in the face of the ECB which is the biggest single Greek bond holder, bought at total value of 40 bn euros. The calls are the bank to give up the profit from these bonds, estimated at 15 bn euros and this money to be given to Greece, thus circumventing the legal ban the bank to finance governments. Literally minutes before Mario Draghi's news conference to start, Greek colleagues tweeted that an agreement was struck among the political parties in Athens and an announcement was expected from the prime minister's office. Oh, what a surprise! As if there was no agreement in the morning? Or, oh, yes, it was not complete! Precisely at 1530 Athens time or 1430 Brussels time the news conference of Mario Draghi started, who announced that he had received a phone call from Mr Papademos, Greece's PM, who had confirmed that there was an agreement. What he decided to say in relation to the call for the bank's participation in the debt restructuring deal was that, if the bank decided to play these obligations with a loss to the benefit of the Greek government, this would be accepted as a direct financing. But if the bank gave up its profit, this could pass as legal. He scolded the journalists for constantly asking where the financing would come from, while the most important thing for Greece was the agreement that was just agreed. "For some mysterious reason we focus on financial things, we talk about firewalls but the most important things are reforms. And we should focus first on that and then the rest". 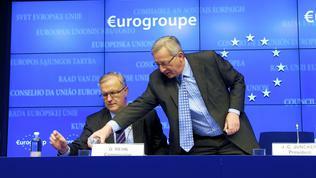 By the way he was first to imply of a link between the deal with the private creditors and that with the troika. While the journalists were trying to classify what was known up to the moment before the Eurogroup, the official statement from the Greek PM's office came out, which was short but instead unclear. According to the translation from Greek which Google provided, in a few sentences it was written that success had been reached in the consultation between the government and the troika but the subject was left open for elaboration and discussion. "Therefore there is a general agreement on the new programme in view of tonight's meeting of the Eurogroup", the statement says, obviously suggesting that what had been achieved, no matter that it was open for elaboration and discussion, was fully sufficient for the eurozone finance ministers to take a decision to give a go ahead to the second bailout for Greece. While the participants were gathering for the third act (the Eurogroup), the tensions were constantly running high because of the controversial signals that the main characters were providing. 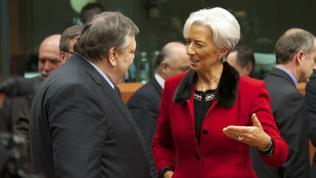 For example, among the first to enter the Council building in Brussels was the IMF chief Ms Christine Lagarde. 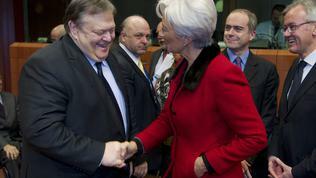 She reduced herself to saying with her disarming smile that the news from Athens were "encouraging". And the Eurogroup chief, Jean-Claude Juncker, a PM of Luxembourg, expressed doubts that a final decision would be taken in the evening. "I don't think there will be a final decision today. This is not a disaster", he was quick to reassure. 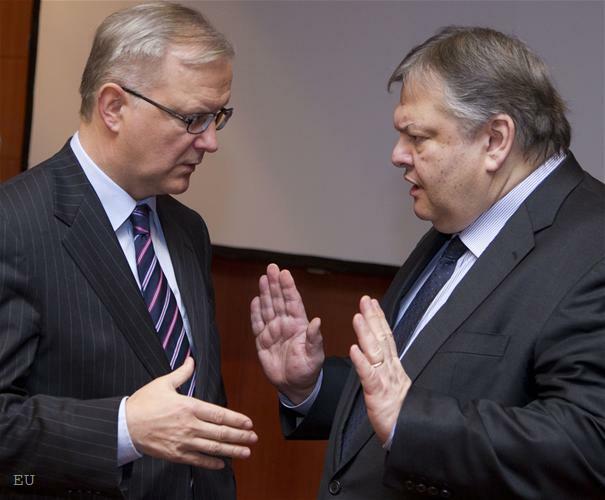 Olli Rehn, EU commissioner for monetary affairs, was cautious, saying that the achieved staff agreement would be very thoroughly reviewed by the Eurogroup. "We will have a very thorough discussion. It is now up to the Greek government and Parliament to convince of concrete actions for ensuring fiscal and structural reforms". There were mixed feelings about whether the third act would be protracted till the early hours of the night or would fit into the planned framework - 2300 Brussels time, midnight Athens time. The delay was only of half an hour, but instead there was a denouement. 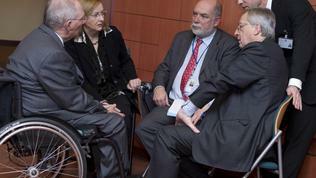 The Eurogroup has put forward to the Greek government and Parliament three conditions before signing the agreement. 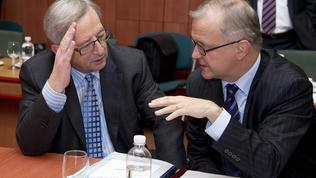 The first, Jean-Claude Juncker explained with visible boredom, was the Greek parliament to approve on Sunday the package, agreed between Greece and the troika. 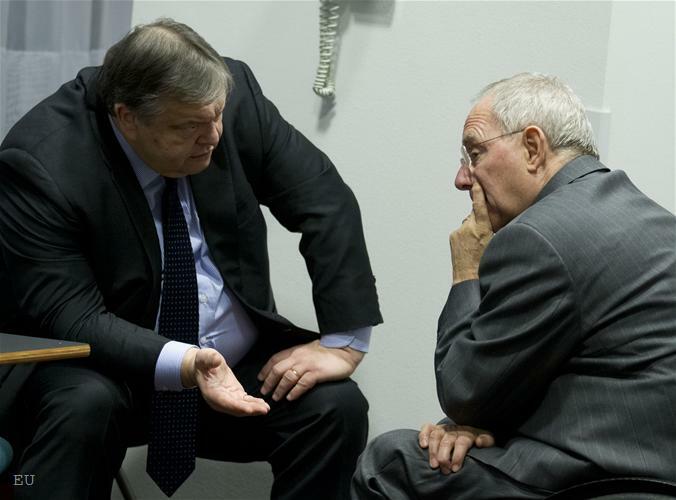 Second is the 325 million euros in question, which the Greek government has to "rapidly identify" where to cut from the budget for 2012 in order to meet the planned budget deficit targets. 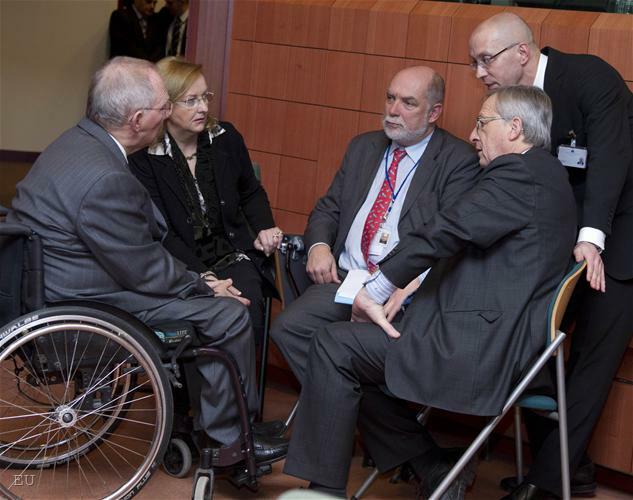 The third and very important condition is Athens to provide "strong political insurances from the leaders of the coalition parties for the implementation of the programme". 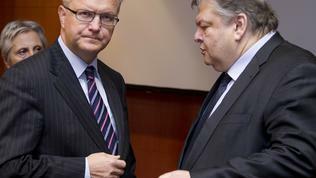 Moreover, the Eurogroup president said, these insurances have to stretch beyond the general elections, scheduled for April. 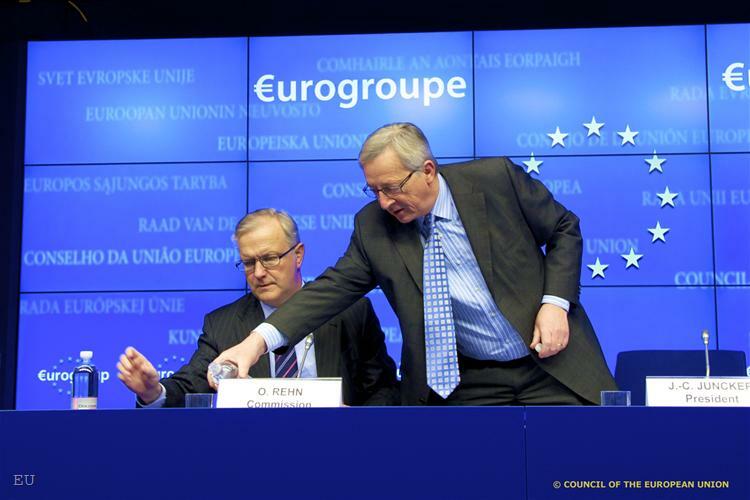 On Sunday the Greek parliament is expected to approve the programme and to the question what would happen if it did not, Mr Juncker responded concisely: "The Greek parliament will not reject the package!" Movement and invitations for elaboration followed in the room, but he just repeated: "The Greek Parliament will not reject the package!" 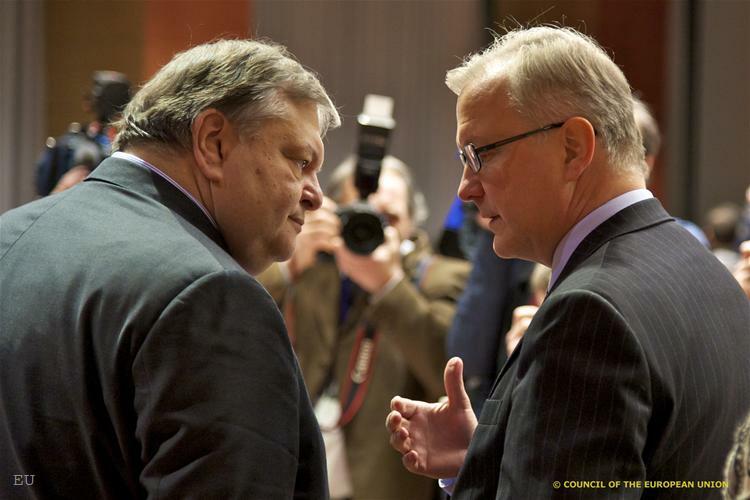 Olli Rehn consolidated the uncompromiseness of the situation, reiterating that the future of Greece was first and foremost in the hands of those who had political responsibility in the government and parliament. The second news, but not in terms of importance, from last night's meeting is that the deal with the private lenders is finalised but is awaiting the agreement from Athens. 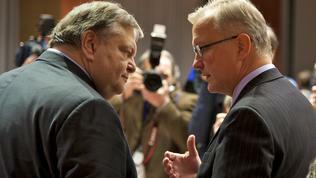 A meeting of the Eurogroup working group is planned for Tuesday and the ministers of finance will gather again on Wednesday but only if all the elements (three conditions) are in place. 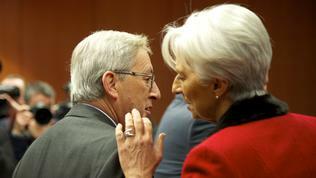 "No disbursement before implementation", Juncker stressed. One of the questions that tormented me throughout the day yesterday and was asked by a colleague last night was where in this entire drama fits the proposal of France and Germany from last week Greece to collect its revenues in a special escrow account, from which to prioritise payment of its debt and what's left to be distributed for budget expenditure. 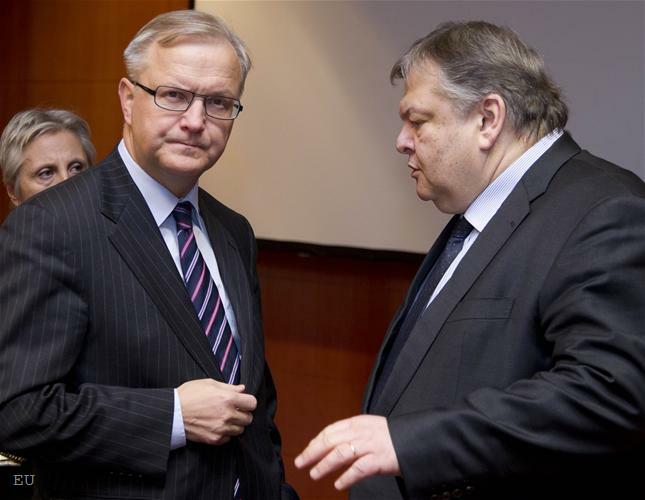 "The escrow account is being explored by the Commission and the EU working group and we are considering it seriously, because it is one relevant possibility for enforcing surveillance and ensuring effective implementation of the programme", Olli Rehn answered. For a finale, because many colleagues were asking what was the atmosphere at the meeting and its purpose in general, Juncker, in his typical style, nearing rudeness, explained: "If I had not convened this meeting I don't think that we would have had this staff agreement this morning. This is a piece of strategy one should not develop because, if are explaining a strategy, you are losing that strategy in the very same moment". In the end of another staging of the Greek play there were no applause but only murmured remarks "Brussels does not believe in tears" [after an old Soviet movie Moscow Does not Believe in Tears]. What we are to see in the near future is a continuation of yesterday's play which is supposed to lead to a putting off the play from the billboard for this season. But will it? The Germanic model for running the EU is the wrong one...Merkel proved that! Germanic Indecision prolonged the uncertainty and virtualy gave the green light to the ratings agencies to target the EU's weakest economies. From the PIIGS...Greece was targetted first in order to (shield) protect the Celto-Latin countries. The PIIS were to suffer lesser damage than Greece was to experaince. That Merkel used the economic crisis to focus on Greece as the scapegoat was based on the Idea it would keep the Euro at low levels, benefiting from low-priced Germanic Industrial goods but that policy proved to be unsustainable. Germanics have always been Selfish...even when they speak of a European family of Nations they are in fact, only thinking of there own financial well-being! Running countries Germany is good at that...running Empires, Germany lacks ther vision and foresight to think big! The EU has it's own Central Bank which the Germans inhibit from printing enough money to back the so called "PIIGS" wailing economies from being targetted by the ratings agencies. Angela Merkel prolonged the agony and sent out the wrong signals to the banking fraternity by keeping the focus on Greece and finger pointing at how lazy Greeks were. These anti-Greeks action shall go down in history! Germany benefitted financially by keeping Greece in the spotlight, for as long as Greece was the Target of the ratings agencies and the banking fraternity, Germay reaped the benefits from a Low Euro...German Inductrial goods got cheaper and remained competitive. Ofcourse, there had to come a Time when that political stance was unsustainable. The Germans did Not show leadership...they showed Selfish Pride only, and cared only for their own economy and themselves. Peripheral countries are not that Integrated and do not have the same comfort of closeness to German Industrial resources and Infrastructure. Germany cant lead Europe...it is too Selfish for that! That Greeks lived the life of riley is atrue statement to make...Greeks had the best life, then Fritz and Gunther got jealous and started a hate campaign against the Greek-Hellenic peoples where the National Character of the modern-Greek was to be ridiculed and humilated in the Anglo-Saxon press and Germanic press and Media. That Greeks had a good life was too much for the hard-working Germanic to bear. Fritz and Gunther had to put in at least 8hrs hard work to earn his keep pressing buttons and pulling levers. The English and the Germans could not take it, watching the Greeks chilling-out in the mid-day Mediteranean sun whilst Nordics and Anglo-Saxons were having to sweat it, so they started a hate campaign to put the Greek in his place...the Greek National Character was put up for assassination and thats what Germanics and Anglo-Saxons are really good at!